Engineering, activity and pharmacokinetic profiling of SYNB1618: creation of a candidate therapeutic strain. (a) SYNB1618 contains chromosomally inserted genes encoding PheP, a high-affinity Phe transporter that can bring Phe into the cell, PAL (stlA), which converts Phe into TCA, and LAAD (pma), which converts Phe to PP. Regulation of these components is carried out by anaerobic-, IPTG- and l-arabinose-inducible promoters to enable activation in the mammalian gut or in vitro. Two recent reports mark important milestones in the area of biologics development. The work by Crowell et al. provides a much-needed improvement in the ability to manufacture biopharmaceuticals in a modular benchtop fashion. Such a customizable production addresses a recently growing bottleneck, as many existing therapeutics are needed in new doses and formulations in order to enable exploratory personalized-medicine type trials, as well as there being a growing need to produce biologics at sites where transportation of refrigerated materials is problematic. 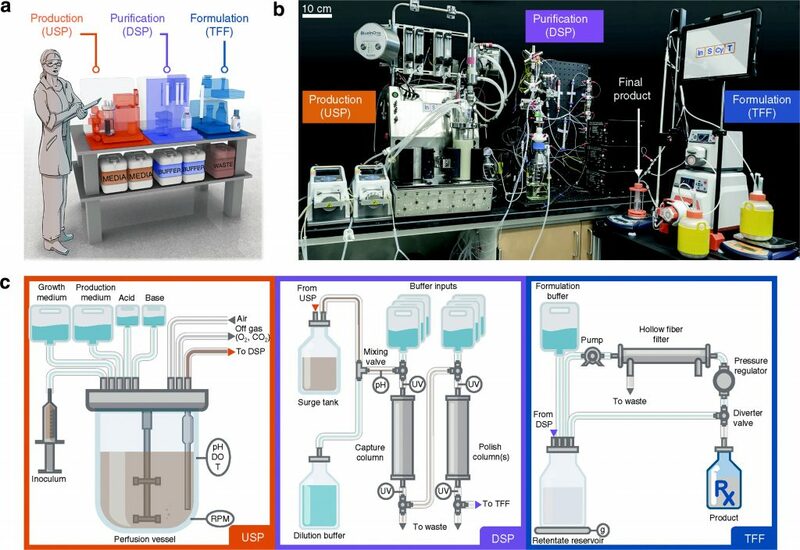 The team built a fully automated and integrated system of protein expression vessels combined with purification and formulation modules (Figure 1a-c). The concept for the different units came from standard biomanufacturing, except that everything was scaled down. The team used yeast as the expression system due to its ease of genetic manipulation and the production of fewer potentially contaminating proteins. Proof of concept was demonstrated with human growth hormone, interferon α, and granulocyte colony-stimulating factor. However, Good Manufacturing Practice compatibility of this new approach has yet to be shown. Figure 1. Schematic of the InSCyT system for on-demand biomanufacturing and demonstration of consistent operation across three distinct InSCyT systems. (a) To-scale rendering of the InSCyT system. Human figure is approximately 5 feet 7 inches (170 cm) tall. (b) Photograph of an operational InSCyT system. (c) Detailed schematic of the InSCyT system, including interactions between modules and key control points for the production (upstream processing, USP), purification (downstream processing, DSP) and formulation (tangential flow filtration, TFF) modules. DO, dissolved oxygen; T, temperature. 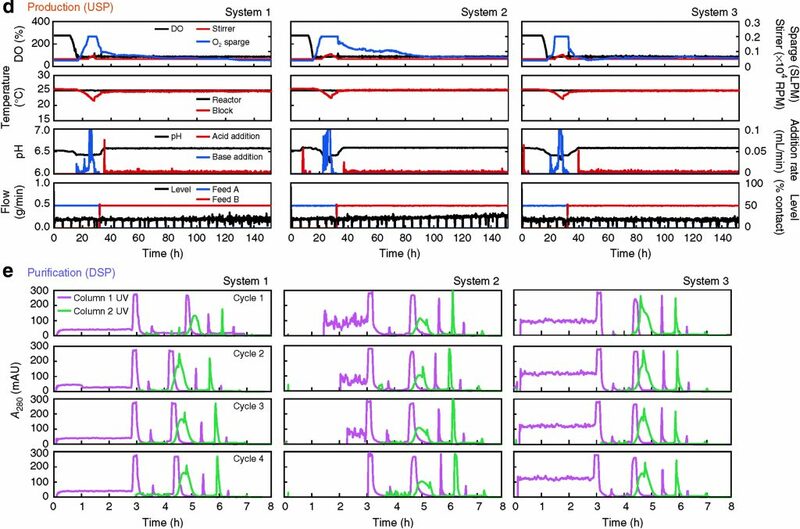 (d,e) Process parameter profiles collected by the control software from the production (USP) module (d) and the purification (DSP) module (e) of three separate InSCyT systems during hGH fermentation. SLPM, standard liters per minute. In turn, Isabella et al. present a long sought-after therapy for phenylketonuria (PKU), a genetic metabolic disease associated with inability to metabolize phenylalanine, which utilizes a live bacterial cocktail and which has the promise to eliminate the need for PKU patients to follow a protein-restricted diet. As a starting point, the group used Escherichia coli strain Nissle due to its well established safety profile and previous uses to treat inflammatory bowel disease and irritable bowel syndrome. Careful genetic engineering was required in order to provide the operon for degradation of phenylalanine, while also providing a transporter to allow phenylalanine to enter the bacterial cell for said processing (Figure 1d-e). The team also had to tackle the reduced viability of the re-engineered bacteria by optimizing various promoters. The new strain showed a good pharmacokinetic profile, Add rapid clearance, and solid data were obtained in a proof-of-concept PKU treatment in mice. Pilot studies were also run in cynomolgous monkey, paving the way to graduating the candidate therapy to human testing (initial assessments in humans under clinical study NCT03516487). Conventional manufacturing of protein biopharmaceuticals in centralized, large-scale, single-product facilities is not well-suited to the agile production of drugs for small patient populations or individuals. Previous solutions for small-scale manufacturing are limited in both process reproducibility and product quality, owing to their complicated means of protein expression and purification. We describe an automated, benchtop, multiproduct manufacturing system, called Integrated Scalable Cyto-Technology (InSCyT), for the end-to-end production of hundreds to thousands of doses of clinical-quality protein biologics in about 3 d. Unlike previous systems, InSCyT includes fully integrated modules for sustained production, efficient purification without the use of affinity tags, and formulation to a final dosage form of recombinant biopharmaceuticals. We demonstrate that InSCyT can accelerate process development from sequence to purified drug in 12 weeks. We used integrated design to produce human growth hormone, interferon α-2b and granulocyte colony-stimulating factor with highly similar processes on this system and show that their purity and potency are comparable to those of marketed reference products. Phenylketonuria (PKU) is a genetic disease that is characterized by an inability to metabolize phenylalanine (Phe), which can result in neurotoxicity. To provide a potential alternative to a protein-restricted diet, we engineered Escherichia coli Nissle to express genes encoding Phe-metabolizing enzymes in response to anoxic conditions in the mammalian gut. Administration of oursynthetic strain, SYNB1618, to the Pahenu2/enu2 PKU mouse model reduced blood Phe concentration by 38% compared with the control, independent of dietary protein intake. In healthy Cynomolgus monkeys, we found that SYNB1618 inhibited increases in serum Phe after an oral Phe dietary challenge. In mice and primates, Phe was converted to trans-cinnamate by SYNB1618, quantitatively metabolized by the host to hippurate and excreted in the urine, acting as a predictive biomarker for strain activity. SYNB1618 was detectable in murine or primate feces after a single oral dose, permitting the evaluation of pharmacodynamic properties. Our results define a strategy for translation of live bacterial therapeutics to treat metabolic disorders. ASSAY & Drug Development Technologies, published by Mary Ann Liebert, Inc., offers a unique combination of original research and reports on the techniques and tools being used in cutting-edge drug development. The journal includes a “ Literature Search and Review ” column that identifies published papers of note and discusses their importance. GEN presents here articles that were analyzed in the “Literature Search and Review” column, published in Nature Biotechnology titled “Love JC.On-demand manufacturing of clinical-quality biopharmaceuticals“, authors are Crowell LE, Lu AE, Love KR, Stockdale A, Timmick SM, Wu D, Wang YA, Doherty W, Bonnyman A, Vecchiarello N, Goodwine C, Bradbury L, Brady JR, Clark JJ, Colant NA, Cvetkovic A, Dalvie NC, Liu D, Liu Y, Mascarenhas CA, Matthews CB, Mozdzierz NJ, Shah KA, Wu SL, Hancock WS, Braatz RD, Cramer SM, Love JC and “Development of a synthetic live bacterial therapeutic for the human metabolic disease phenylketonuria“, authors are Isabella VM, Ha BN, Castillo MJ, Lubkowicz DJ, Rowe SE, Millet YA, Anderson CL, Li N, Fisher AB, West KA, Reeder PJ, Momin MM, Bergeron CG, Guilmain SE, Miller PF, Kurtz CB, Falb D.